At this time yesterday I was still at the office; I hadn’t eaten since lunchtime, and I still had a list of cascading style sheet (CSS) bug fixes to get through before I could drive home to see the lovely Jane and eat the veggie curry she had kindly made for me. At tea time. Normal tea time. I got home at 10:45 and was in bed, having eaten and washed by 11:10 — I was exhausted, but satisfied that the majority of bug fixes had been done. My colleague Steve didn’t leave the office until 02:00!! How we were both still awake at 17:00 this evening I have no idea. The long hours weren’t only to do with our being conscientious about our work, today was our deadline: launch the new website, ready or not. 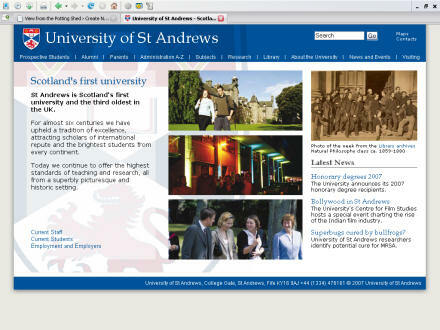 At little before midday the button was pushed and the new website went live at www.st-andrews.ac.uk. The result of one year of solid work. On the whole, I have to say, I’m happy with it. Ideally I would have loved to have had more time — a couple of months, maybe — to get the content and layout just right but life’s just not like that sometimes. So at the moment it feels a little like a new-build house where the painters and carpenters are still in and some of the furniture still needs to be moved in. But on the whole it’s a house that we’re happy to be moving into! There will be ‘teething problems’, there will be bits that don’t work as expected, content that is out-of-date (about 99% of it was copied directly from the old sites — of which there were about 35 — into this new single site), and links that don’t work. But that’s life … and it will certainly keep us out of mischief for a while. One thing I will say: don’t even try to view the site on an old browser. This is a modern-browser only site: Mozilla Firefox 2.x, Opera 9, Apple Safari … and if you really must Internet Explorer 7 (or IE6 if you really are old school). If if really looks weird then update your browser. As I indicated, the old website actually comprised of about 35 independent websites; each support unit, for example, had its own site. So in order to find the information you wanted you had to first know which support unit managed that information. For example, fees: Registry set them (of course), Finance collected them, and Student Support Services helped out folks who were having trouble paying them! Three separate units, offering information about the same thing, but spread across (at least) three separate websites. Our analogy was that it would be a bit like a supermarket where the aisles are arranged according to the name of the delivery driver who brought the goods, rather than by the product. The new site is arranged by the product, and further categorized by the type of visitor. So, to take our example of fees above, all of this information is (or at least will be) found under Current Students > Money Matters. with the idea being that these pages are those audiences’ homepages, and within those sections the information can be specifically targeted to those people. I’m sure it will take a little getting used to by users, and fine-tuning by us, but we’ll get there. One thing I can say, however, is that it has been a wonderfully enjoyable project to work on, and the support and encouragement we’ve had from colleagues has been tremendous. So a huge thanks to any of you who may be reading this. For an alternative — and less biased — view of what people think of the new site check out The Sinner message boards for some students’ views. Warning for those of a nervous disposition: there is some swearing. And bod spilling (sic). To be fair, the comments taken as a whole are pretty balanced. Some understandably feel disoriented – particularly in the middle of exams, while others are waiting before passing judgement.